1 - Cook turkey as specified on package. Always cook to well-done, 165F as measured by a meat thermometer. 2 - Add hot pepper sauce. Stir to combine. 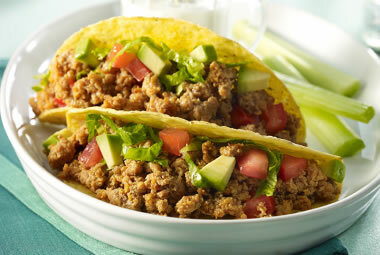 3 - Fill tacos shells with lettuce, turkey mixture, tomatoes and avocado. 4 - Drizzle with blue cheese dressing.